Magnifications are approximate and generally rounded to nearest whole number with few exceptions. Items in red are objectives in the collection at this time. Some of these, like the Watson Apochromatics began to be made a little later than the production date of the Grand Van Heurck in this collection. At the time that stand was made, the standard mechanical tube length for Watson objectives was 200 mm (about 8 inches). A 160 mm tube length was the Continental European standard. Earlier the standard English Mechanical tube length was 250 mm or about ten inches. Eventually, the RMS standard also became 160 mm. It is not surprising then that the original magnification card for that microscope was replaced by a typewritten list of objectives designed for a 160 mm tube length, especially since German continental objectives were becomming popular, even in England. The 2 inch holoscopic objective* is not labelled as a holoscopic, but must be a Holos objective because of the typically high n.a. available only for a Holos. T.L.= Mechanical Tube Length. The following table shows some of the Watson Standard tube lengths during the years when this was noted in the catalogs. Watson usually noted that they could supply objectives designed for any tube length desired by special order but usually at no additional charge. The 160 mm length, eventually the RMS standard, was usually readily available also because it was the Continental standard for many years. The reader, and even some modern experienced microscopists, may be confused about tube lengths and magnification vs focal length (FL). First one must understand that there are two different types of tube length; the one alluded to above is the mechanical tube length-the distance from the top of the tube to the bottom where the objective screws in. The second and more difficult to understand is the optical tube length (OTL). This is defined as the distance from the back focal plane of the objective (usually located somewhere in the middle of the objective itself), and the primary image plane within the eyepiece, usually about a cm below the top of the optical tube. 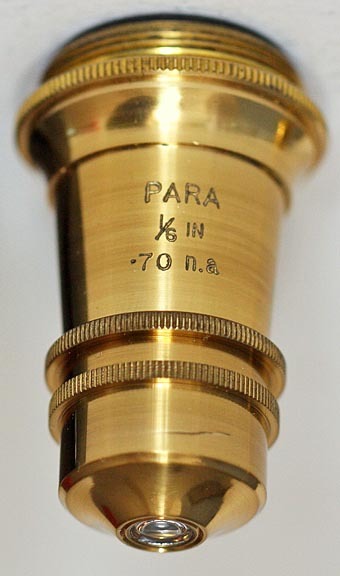 This distance varies not only with the focal length of the objective, but also varies with its design; in other words the OTL with identical mechanical tube length and identical eyepieces but with a 6 mm Parachromatic objective will not be the same as the exact same setup but with a 6 mm Apochromat or a 6 mm Holos. Generally magnification of the objective is equal to the OTL/FL of the objective. To make matters worse the exact magnification will vary from person to person as each of our own eyes have different degrees of distortion from 'ideal', i.e. we are all far-sighted or near sighted to some degree. Using spectacles changes the equation again so even if we wear corrective lenses, these changes in magnification cannot be predicted without direct measurement of all the factors involved. Suffice to say that the modern practice of labelling objectives with a magnification power is a bit misleading as the exact magnification is unlikely to be that exact number! Lastly, consider that ordinary objectives are designed for a standard coverslip thickness of either 0.17 (presently) or 0.18 mm in thickness (previously); any deviation in the distance of the specimen from the top of the coverslip will have an increasing effect of degrading the quality of the image as the magnification increases or the focal length decreases. It is for this reason that with higher powers, a correction collar or drawtube are needed to allow adjustment of tube length to suit any variation in the coverslip-top-to-specimen distance. For this reason, critical mounting is sometimes done on the underside of a coverslip of standard thickness, and then the mount cemented to the slide. It is because critical adjustments to tube length may be needed at high power, that the mechanically adjustable drawtube of the Van Heurck microscopes came into use. If the thickness of the coverslip is thinner than the design of the objective requires, the tube length needs to be increased or lengthened; if the coverslip is thicker (or the subject is below the bottom of a standard coverslip), the tube length needs to be shortened. Modern microscopes do not usually have drawtubes as this is not feasible for a binocular; one is forced to use an objective with a correction collar for critical high power work with dry objectives on such instruments. This is rarely done today; when higher magnification and resolution are required, the microscopist usually simply resorts to an oil immersion objective..